The cross commemorated the death, on April 1st 1899 of his son Byron Henry Clark at the site of their Mount York home known as "Drachenfels", which stood near the cliff edge facing Victoria Pass. The house and its extensive outbuildings, coach-house and orchard were lost in a bushfire in 1902. On the day of the tragedy, Mr. Clark was in Sydney, while his second wife Georgina and several friends were staying at "Drachenfels". Two of the Clark children, Hazel, aged 14 and Roland, 10, and a couple of companions decided to visit a small cave on the cliff face about 15 metres below the top and some distance along a ledge. The children were experienced in scrambling around the local rocks and cliffs and the descent presented no difficulties. However, on this occasion, just as they had almost reached the cave, it was noticed that their younger brother, Byron, aged 6, was following. He had already descended from the top of the cliff and was just commencing the traverse, when one of the girls, realising the danger, called to him to go back. The words had hardly left her mouth when the ledge of rock on which he was standing broke and he fell about 50 metres to the foot of the cliff, striking a ledge about half way down in the course of his fall. Two of the girls and young Roland Clark climbed back to the top of the cliff and informed Georgina, who set off with her companions by a round-about route to the base of the cliff. In the meantime, Hazel and Roland climbed down to the base of the cliff, where they found young Byron lying badly injured but scarcely marked amongst the fern and bracken. The women decided to carry him to the top but Byron died during the ascent. The family never again lived in "Drachenfels", which they placed in the care of Sam Wilson, a storekeeper at Mount Victoria, who made occasional visits to the property until the buildings were destroyed by bushfire. Byron is buried at Waverley Cemetery in the family plot. 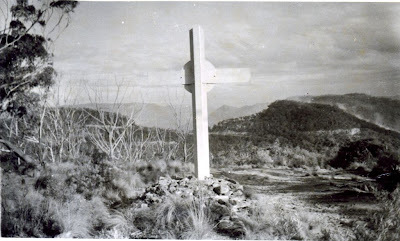 The property has changed hands a number of times in recent years and the cross was removed from the cliff edge by the owners around 1989 to discourage sightseers. 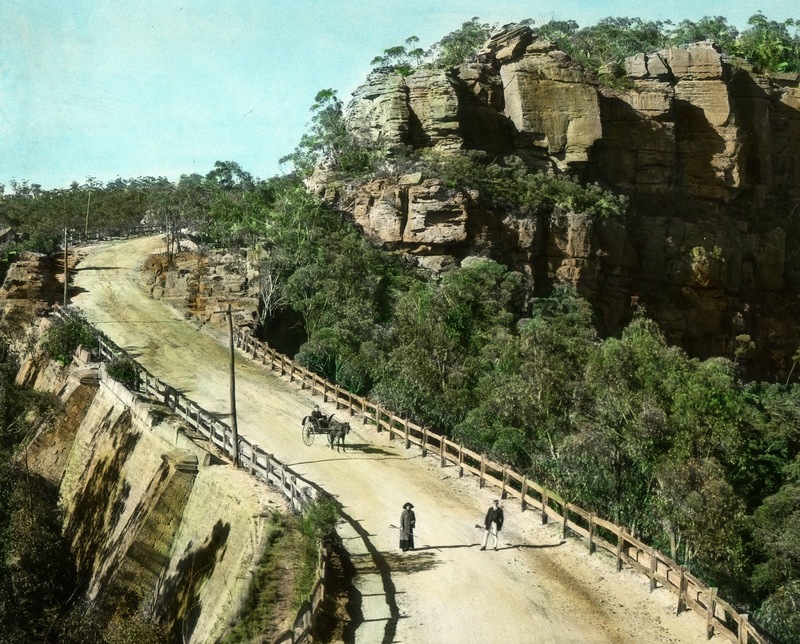 The site known as the Marcus Clark Cross received Blue Mountains City Council heritage listing in 1991. It is believed the White Cross remains on the site. * Local Studies research & clippings files. 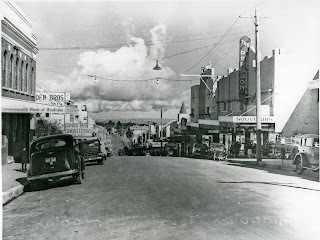 As a young child in the 60s I used to see the cross on journeys to Orange. Dad told us a young boy had fallen off a cliff there and he was right! As a child I would always look up to the hill to see the cross as we drove through the pass. I also was told that a little boy had fallen off there. I used to find it intruiging this white cross up on the edge surrounded by trees. Wish it was still there so I could've handed the story on to my children. There could have been a memorial story put at little hartley on the white cross to deter visitors to the cross. People probably just wanted to know the story. I also remember, as a child, being told by my father about Byron Clark's fatal fall from the cliff near the family home. It all seemed so sad and poignant...70 years after the event and yet the memorial was still there. It's such a pity that the new owners of the property have removed the cross. I remember seeing the cross while on a primary school excursion from Wollongong to the Blue Mountains and will never forget the eerie feeling as we were drove past slowly with the bus driver telling us about it, glimpsing it through the mist on a dark and drizzling day. It was quite scary. I have often thought about it, that poor little boy and his family. I wondered what happened to the cross over the years. I had just thought the bushland had grown around it so we couldn't see it anymore. I was first told this story (over 30 yrs ago) when my 5th class at Ettalong PS had a school excursion out west. The driver told us the sad tale as we drove through the mountains. I have never forgotten it.